According to the Evangelists, Our Lord cleansed the Temple on at least two occasions. St. John describes the first cleansing as having occurred directly after the remarkable miracle in which He saved the day at the wedding reception at Cana. The other Evangelists do not record this cleansing, but they tell us about another time when Our Lord cleansed the Temple approximately three years later-just after He entered Jerusalem with palms bestrewed in His path and hailed with Hosannas – shortly after that, He was crucified. and found in the Temple those that sold oxen and sheep and doves, and the changers of money sitting: And when He had made a scourge of small cords, He drove them all out of the Temple, and the sheep, and the oxen; and poured out the changers’ money, and overthrew the tables; And said to them that sold doves, Take these things hence; make not My Father’s house a house of merchandise. Now, doesn’t that seem a little harsh? On the one hand, I can see why Our Lord might fashion a “scourge of small cords” to drive out men who were apparently swindlers. Who can’t feel a little anger against men who are making a profit from the piety of those who come to the Temple to offer sacrifice? I am imagining the disadvantaged, the widows and the poor, the blind and the lame, having traveled a great distance on foot to offer a humble sacrifice of praise to the Lord, only to be cheated and swindled out of the little money they had at the very Temple entrance. On the other hand, I am not a big fan of animals in church either. Maybe I am wrong, but I have always imagined that the doves, oxen and sheep were probably in the Temple vestibule and not actually milling about in the Temple itself. In any case, that the animals were somewhere in the Temple is clear. Not a good idea. But Our Lord who was born in a stable has always seemed to have been sympathetic to animals. Doesn’t it seem a little harsh that He would take his scourge to them? He drove them all out of the Temple, and the sheep, and the oxen…..
Aside from the literal signification of this passage, I am inclined to think that the naming of these animals, these three species in particular; oxen, sheep, and doves are meant for our edification in an even deeper way. And, of course, we should be looking for something deeper here because Scripture is replete with wisdom and profound meaning if we just scratch, or perhaps graze, or even till beneath the surface! I have to confess that I never would have thought anything more about this passage if it wasn’t for my favorite ‘go to’ book about the Gospel. What is that book? The glorious Catena Aurea, or the ‘Golden Chain’ of St Thomas Aquinas! If I was a regular homilist, would I consult the Catena Aurea as a regular form of homily-prep? 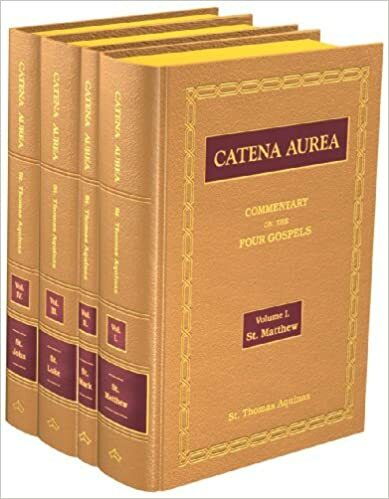 The Catena Aurea is a great way to become familiar with the very best things that any Father or Doctor or great Theologian or Scriptural Exegete (prior to St Thomas of course!) had to say about any and every line in the four Gospels. St. Thomas (without the aid of Google mind you! ), in his seemingly omniscient and encyclopedic grasp of everything that was ever said by anybody worth listening to, has simply gathered up all of the best and brightest thoughts and strung them together as a sort of chain-like commentary. Voila! The Catena Aurea! 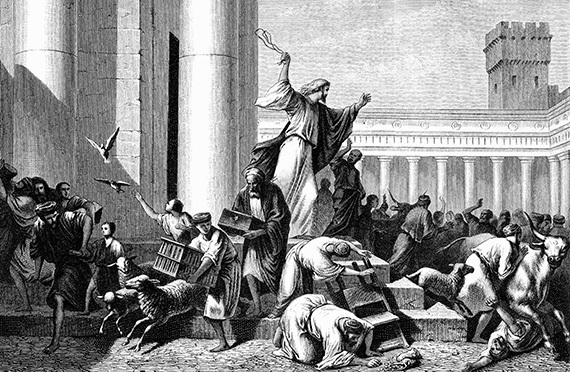 So what do we find in the Catena Aurea concerning this Sunday’s Gospel concerning the Lord’s first cleansing of the Temple? By the Temple we may understand, too, the soul wherein the Word of God dwells; in which, before the teaching of Christ, earthly and bestial affections had prevailed. The ox being the tiller of the soil, is the symbol of earthly affections: the sheep, being the most irrational of all animals, of dull ones; the dove is the type of light and volatile thoughts. 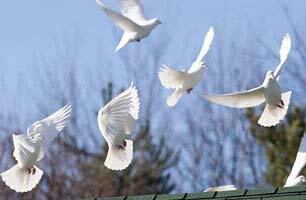 In other words, the oxen, the sheep, and the doves could very well represent our affections or our emotions. I am not completely certain that I am understanding Origen correctly, but his remark certainly does inspire me with the thought that this Gospel passage really does have everything to do with the right ordering of our passions or affections. Is it ever justifiable to be angry even to the point of using aggressive force or even some sort of violence? 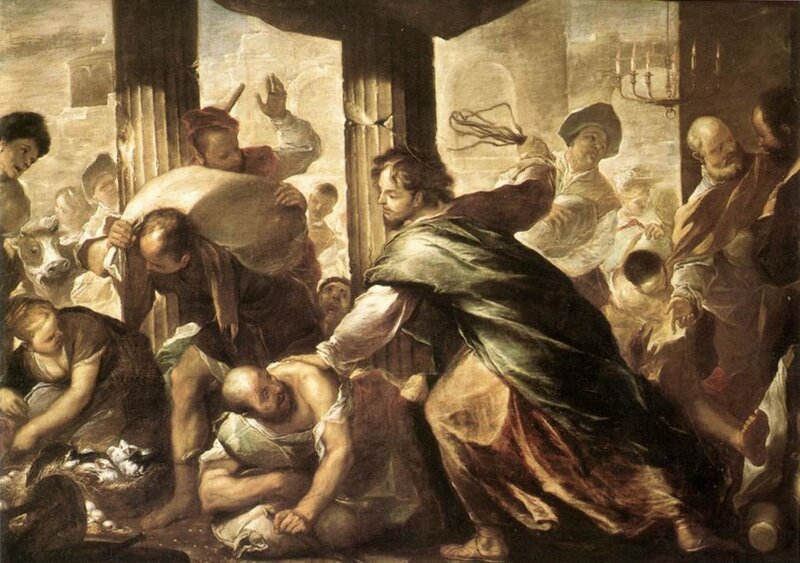 Look at our Lord in the Temple when He fashioned a scourge, and then He forcefully drove the money changers out of the Temple! This is sure a case of righteous and justifiable anger. Yes, it is good to sometimes use our passions – such as anger- to get things done. Especially if we are directing our passions to the service of the Lord! So when our Lord cleansed the Temple, He certainly was illustrating a proper use of the passions, especially the irascible passions! When we think about it, doesn’t Origen’s comment seem right on the money? Oxen are sort of lugubrious slow tillers of the soil. They are plodders and difficult to move. They rarely demonstrate enthusiasm. Sheep are …well just sheepish. They appear to lack self-confidence and are easily led by others. 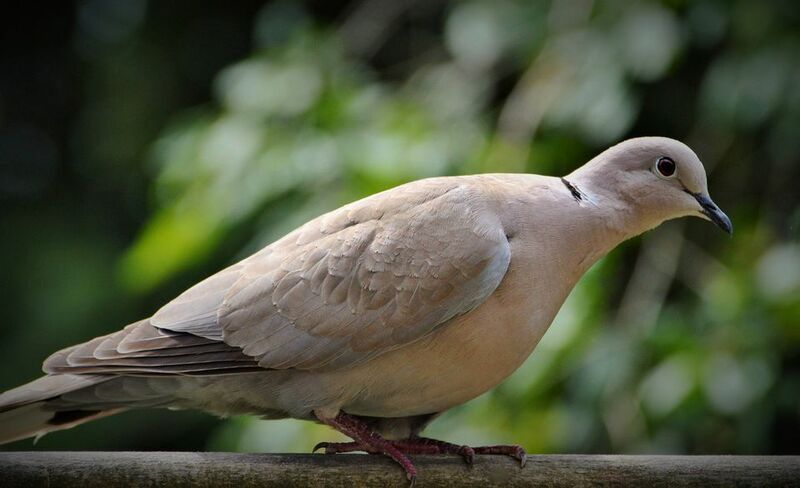 If oxen are heavy-set and phlegmatic to a fault, Doves are just the opposite. They are light and superficially sanguine. like oxen who are earthly and slow-moving. They are slothful and caught up in the dirt of the world. like sheep who lack confidence and do nothing but follow the one in front of them. They are easily swayed to follow whatever the fashions and passions are of the moment. like doves which become frightened at the first sight of danger. They quickly alight on this or that surface (or doctrine) which they find attractive but are just as easily put to flight. On the contrary, authentic disciples of the Lord are anchored in the truth which is Jesus Christ. They serve His will unwaveringly and eagerly, because they have set their hearts on Him. They are filled with love for Him and are moved towards His service with consuming passion, but passion under the direction of reason. His disciples are filled with rightly ordered affections, even zeal, for His service and for His Temple! For zeal of Thy house hath eaten me up. when they witness the behavior of Our Lord’s true disciples now consumed by no less zeal for the house of God. This entry was posted in Catena Aurea, Origen, passions and tagged Aquinas, Bede, Cleanisng the Temple, doves, oxen, righteous anger, sheep. Bookmark the permalink. 4 Responses to Get Those Animals Out of My House! The Roman Catholic Church decided it would be friends with everyone as a result of the Second Vatican Council in the end it was not even a friend to its followers. It is time we assert our values and let people know you must the same way during the week as you are in Sunday Mass. Excellent blog! I am glad you have persisted in wring this blog. And I see you have made it at last into the weekend WSJ under th nom de plume Michael Zimm, although you’ve also managed to cleverly conceal your style, the message that the Liberal Arts is the most worthy degree pursuit is clearly your invention. No one else would dare to put forth such a dangerous proposition. Well done and congratulations! Pope Benedict XVI as Josef Ratzinger wrote in his trilogy: “Jesus of Nazareth” that Our Lord drove them out, crying that they turned His Father’s house of prayer into a den of thieves. This because they had set up their business selling sacrificial animals in the Court of the Gentiles, a place within the Temple reserved for Gentiles to worship and pray while visiting Jerusalem, thus preventing suitable space in a very disrespectful way to both the Gentiles but especially to God.